The makers of Snickers think it's time to melt the energy bar and candy bar concepts together. So Masterfoods USA, formerly M&M/Mars, is keeping an old name on a new product, Snickers Marathon, and is promising much of the same chocolate and gooey caramel flavor. Adding vitamins, minerals and a blend of protein may help get rid of one traditional ingredient for some buyers: guilt. Candy industry experts think the bar will be a hit with a public that is becoming more health conscious but finds some energy products taste like — well, not at all like candy. Nutrition experts aren't at all sweet on the idea. Bonnie Liebman, director of nutrition at the Center for Science in the Public Interest, sees all energy bars as "fortified junk food." She said most people don't realize the term energy food simply means food with calories, adding that most Americans are overweight, don't get enough exercise and don't need the 200-plus calories in a typical energy bar. The two-ounce Marathon bars come in chewy chocolate peanut and multi-grain crunch, both with the Snickers classic trio of chocolate, peanuts and caramel. Former chef Bill Bellody, head of Masterfoods' prototype and design group, said his staff spent about three years tinkering with the flavor. The company is aiming the bar at active people, and points to San Francisco firefighter Joe Horton, a father of three children who often works 96-hour stretches, as one of eight "marathoners" recruited to help evaluate the bars. "It's got a nice texture and I like the taste," said Horton, who still runs, bicycles, plays basketball and skis regularly. "Other bars I've had before taste like chalk or have a chemical flavor to them." Product line extensions are an old, time-proven tactic in the food industry. Mitchell Pinheiro, packaged food analyst at Janney Montgomery Scott, thinks candy companies can succeed in the energy bar market by luring people who feel guilty about eating candy bars. The drawback could be a drop in sales of original Snickers, Pinheiro said. The big candy makers have some advantages over smaller health food companies, including deep pockets and strong distribution channels. "Mainstream marketers are moving into the category because of the double-digit growth," said Stefanie Thompson, who covers candy and packaged foods for Advertising Age magazine. Examples include Kraft Foods, Kellogg Co. and Quaker Oats. And as the bars go mainstream, they are becoming more tasty, with chocolate coatings and the like, Thompson said. Bernard Pacyniak, editor in chief of Candy Industry magazine, says Masterfoods has an excellent chance of success in the energy bar market, given competitive pricing (suggested price is $1.49), Snickers' popularity and marketing savvy. "The fact that Masterfoods is getting into (energy bars), I think that signals that they're going to go after Nestle pretty hard," Pacyniak said. Nestle SA, which competes with Mars in global candy and pet food sales, owns the popular Power Bar brand. 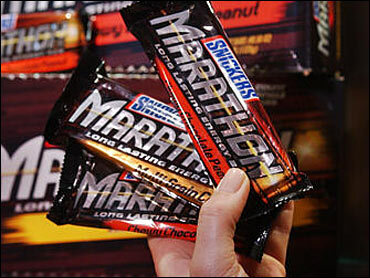 Moving into the energy bar market fits in with other changes at Masterfoods. The Hackettstown-based company has centralized its U.S. snack, food and pet food divisions and added products ranging from breath mints to organic frozen foods and drink vending machines. Today Masterfoods' parent company, Mars Inc., claims about $15 billion in global annual revenues — two-thirds from other countries and has 30,000-plus employees worldwide. The company, owned by three of founder Frank Mars' grandchildren and their children, boasts an enviable portfolio of well-known brands of snacks and packaged foods, including Uncle Ben's rice and pasta products. Also a maker of pet food, it has top brands including Pedigree for dogs and Whiskas for cats. One key to success, said Masterfoods USA President Robert J. Gamgort, is being privately held. The company can focus on the long term, spend continuously on advertising and stress quality over profit margin, he said. "A lot of our growth has been through our core brands and (product) line extensions, but now we're trying some different things," he said. "We feel like we can do so much more." Masterfoods got its start in Tacoma, Wash., in 1911, when Frank Mars began making butter creams for his mother. The company's first success was the Milky Way bar, introduced it in 1923 after Mars moving his business to Minneapolis; 3 Musketeers and Mars Chocolate Almond Bar were other bestsellers. Then son Forrest E. Mars Sr., who had started a confectionery and canned pet food business in England in the 1930s, established M&M Limited in Newark in 1940. Its candy-coated, "melt in your mouth, not in your hands" M&Ms soon became a staple in military rations. In 1967, the U.S. food businesses were consolidated into M&M/Mars, which last year was renamed Masterfoods USA. Newer ventures include Flavia office beverage systems, which quickly brew a variety of coffee and tea flavors, and Seeds of Change, a seller of organic flower, vegetable and herb seeds that the company bought in 1997. Last year, that business added a line of frozen foods. Other recent product successes include Uncle Ben's pioneering rice and pasta bowls and launches of Snickers Almond bar; Aquadrops mints; tiny, round versions of its top candy bars called Poppables; candy bars that top a shortbread-style cookie, and Uncle Ben's Breakfast Bowls, with French toast and egg varieties.